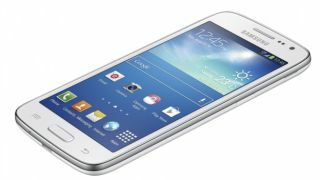 Samsung has unveiled the Galaxy Core LTE/4G, a low-end smartphone aimed at ensnaring those users seeking super-fast data speeds, rather than high-end specs. The device, which is likely to go on show at MWC 2014 in Barcelona next week, only packs a 1.2GHz dual-core processor, Android 4.2.2 Jelly Bean and a significantly below-HD 4.5-inch 960 x 540 PLS TFT display. On the rear there's a modest 5-megapixel camera, coupled with a negligible 0.3 megapixel front-facer, while buyers can rely on 8GB of internal storage (plus MicroSD), Bluetooth 4.0 and a 2100mAh battery. On the plus side, it can shoot 1080p video at 30fps, while the presence of TouchWiz UI means all the usual S Voice, S Translator, Continuous Shot and Smart Shot goodness. among other Samsung apps. The relatively unflattering spec sheet will presumably allow the company to keep the handset as cheap as possible to aid those speed-focused smartphone fanciers. Samsung has also pointed out the new Galaxy Core LTE/4G (name will depend on region), will be a category 4 device, meaning it'll be capable of harnessing speeds of up to 150Mbps, depending on what's available in the area. The company hasn't confirmed pricing or availability just yet, but has said it will be available in Europe and Asia. We'll probably get the full skinny at MWC next week, so stay tuned.